Causes launched with the Facebook Platform back in 2007 as a way to help friends more easily campaign for the social causes of their choice. The app benefited from getting in early on the platform, being the only one in its category (other developers were building poking apps or games at the time), and from having a tight relationship with Facebook via cofounder Sean Parker. The product, though, has lost some momentum over the years — at least until a multi-part revamp that the company is in the middle of pushing through. Most strikingly, the Facebook canvas app no longer exists. 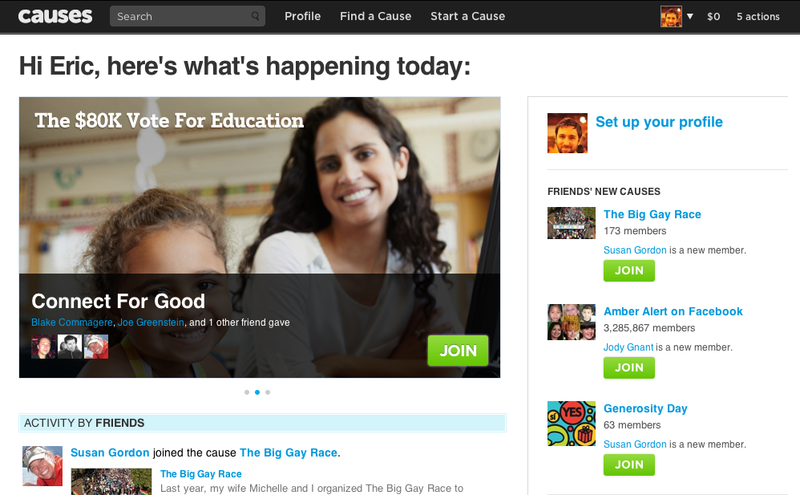 Instead, as of this past fall, everything is now on Causes.com. But, consider this a preview of sorts. The company is planning to roll out major new features in the coming months, with a full launch planned for mid-March. The site today still relies on Facebook as much as ever, but as an Open Graph app developer (as it announced last week) If you’re signed in to Facebook, you can sign in to Causes with the click of a button, and easily do things like invite all of your Facebook friends, or just the ones who have installed Causes at some point in the past. And because it’s an Open Graph app developer, the company is now able to share your activity back to your Timeline and your friends’ Tickers, in addition to the news feed, notifications, etc. The more dramatic changes have been in what else the site offers. Chan has been leading an overhaul that for the last six months has focused on the user experience, cutting underperforming features, introducing usability testing and other unglamorous but crucial aspects of product development. The design has been streamlined from the clunky-feeling app to focus on the key aspects of Causes today. A big rotating image shows major Causes across the top of the site, with recent activity by your Facebook friends underneath. The search bar, along with links to your profile and to finding or starting a Cause are located across the top navigation bar. To their right, you’ll find an image of yourself (your Facebook photo) as well as the amount of money you’ve raised and the number of actions you’ve taken. Below on the right-hand side, you’ll see a link to your profile, your friends’ new Causes, and the Causes raising the most money on the site. The focus, meanwhile, has shifted more to quality awareness-building, away from the promise of fundraising (which has to date not always yielded the funds that many users had hoped for). If you create a new Cause now, you’ll also see some of its newer features added in, like pledges, petitions and polls — and, if you’re a nonprofit, you’ll see that the organizing tools that it had originally launched separately have also been integrated. While the site is still full of purely altruistic causes, like Village Enterprises’ funding campaign to help support entrepreneurs in developing countries, Causes itself is also available for corporate clients who want to get in on the doing good thing. You know, the companies with lots of fancy-sounding efforts about Corporate Social Responsibility, that often produce less than clear results. Take AT&T, for example. The perennial under-performer in customer telecom satisfaction ratings has a few credible uses of Causes going on. One is a quiz that builds awareness around wasted cell phones — answer it and the company will donate $2 to The Nature Conservancy. Another use is a pledge not to text while driving, where the company promises to donate $2 to “educate drivers” for every action. Evolving along with Facebook’s platform has brought Causes from being a lightweight app to a socially-powered web site. On the business side, the company is now monetizing through the corporate clients, as well as ads. As a product, it is also maturing as the web wakes up to the true power of online activism. The past year has been full of examples showing how online campaigns can force governments, corporations and other powerful entities to change their decisions, most recently with online activism helping to convince congresspeople to delay SOPA and PIPA, two controversial anti-piracy bills. Causes traffic, which has fallen after the viral early years of the platform, has already been on the rise in recent months due to the changes the company has been pushing out. As it continues to add features and refine how web users engage with it, Causes is particularly well-placed to be a go-to tool for a new era of internet activism.